In order to help, we have provided the following information about the house and the surrounding area which may be of interest to you. If you require any further information, please do not hesitate to ask us. Furthermore, we are ready and willing to deal with anything you need in relation to our facilities and services. Our aim is to improve on a daily basis, and in order to do so your comments are vital to us. The land surrounding the house belongs to the Pena family. All of it has been cultivated so that guests can enjoy the peace and tranquillity which the place transmits. Near the river, various gardens have been created with rustic benches, and paths and steps placed to overcome the uneven ground. The enclave is an ideal place to relax, whether by reading a book or having a stroll. From the outside you can clearly appreciate the three-part structure of the building. In the first part the dining room, living room and kitchen are found. The second houses the attic with the owner’s rooms and the ethnographic museum, as well as three guest rooms. The remaining rooms are located in the third part. The oldest documents about the house date back to the end of the 19th Century. In 1892, the grandfather of the current owner made an exchange with the Marquis of Montesacro, whose representative he was, by which he acquired the original house which corresponded to the current areas of the dining room and living room. However, it is very possible that this early house was already three hundred years old. The techniques used in its construction are similar to those of other buildings about which documents remain testifying to an age of nearly three centuries. The particular way of working the stone, using blocks like those that you can see in the doorposts, the rubbish tip or the oven, would be one of these characteristics. Certain sculptured remains today displayed in the museum, which were found during restoration work carried out in 1998, could even date back to pre-Roman times. Around 1908 the house was significantly extended, making it into the building as it stands today with its characteristic division into three parts: the first, which comprises the current living room, kitchen and restaurant, the second and largest with the museum, three rooms and private living area, and the third with four double rooms distributed on two floors. But it was in 1948 when the father of the current owner modernised the facilities and acquired the necessary permits to make use of hydraulic energy. 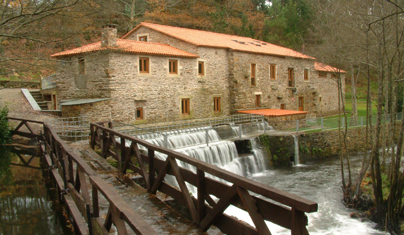 Today converted into a rural house for tourists, O Muíño de Pena (or, as it is known in the region, A Maquía de Pena) became the centre of a developing industry. Using the river’s waterfall as the driving force to perform tasks such as milling grain and sawing wood, it provided the residents of the zone with an essential service for decades. The importance of the house was at its utmost when, in 1949, a severe drought made the mills of the area unworkable, preventing the production of flour and the performance of tasks then essential for survival. The father of the current owner acquired a combustion machine which worked by burning wood outside the house. With a worker always present, this machine worked uninterruptedly, day and night, for three months in order to meet the needs of the community. The noise generated by the novel wheel, which worked using a mechanism of pulleys and belts, was similar to that of a constant hammer, and soon became familiar to all the residents of the area. This business initiative allowed the bakers to bake their bread, the local residents to grind their grain and other artisans to saw their wood in an especially harsh summer. At the same time, the house became a bustling meeting place for the local people, who talked and shared news while they waited patiently for their turn to grind or saw. The factory continued in operation until the 1970s, even though in its last years it was only used as a mill. By then the father of the current owner had built an electric sawmill equipped with modern technology. In 1998 restoration work began on the house, which lasted for four years. In January 2003, O Muíño de Pena opened its doors to the public once more, this time converted into a rural house for tourists. However, it still retains many of the marks left by previous activities, which are now displayed in a small local history museum. In this new phase, the place aims to not only offer a top hostelry and restaurant service, but it also attempts to convey to its guests the sober charm of artisan knowledge, the peaceful authenticity of the rural area, and the pleasant, relaxed atmosphere of a traditional community meeting place. There is a living room above the dining room where the guests can access a small library and collection of films. There is a VHS machine, DVD player and digital TV with satellite connection. O Muíño de Pena is home to an ethnographic museum, which gives the house its own character by bringing together the essence of its past. It also gives the council of O Pino its first and only museum. Within the museum over eighty pieces are exhibited, representing the different trades performed when the house was a traditional work centre. In the entrance are the mills. One was used to grind corn and the other for wheat. During restoration the stones of one of the mills have been left visible in order to better understand how it worked. On the landing are various objects: a collection of very old stones found during the restoration of the place, a Vietnamese rice mill; the old instruments used to measure grain (ferrados) and even Roman scales. In the basement there is a mill wheel in perfect condition. On descending the small step we can see the axis which provided the force necessary for it to function. It worked in the following way: thanks to the waterfall, a turbine moved a primary axis, located where the mobile wheel now sits. The aforementioned axis set off the main one through a wide belt to which various pulleys were fixed. To these more belts were attached: some connected to the mills and others to the saw and the sanding machine, which were on a higher floor destined for carpentry tasks. The original saw remains, which is approximately 140 years old. Around it are various tools used to make linen, a task which was carried out over time through a fulling mill installed in the small meander in the river. Finally, in a display case on the wall is a collection of tools used in the past for ironwork and woodwork. If you would like more information about the working of the various mechanisms, or to consult old documents relating to the house, please do not hesitate to let the staff know, who would be delighted to answer any doubts or question.